At the end of December, we started talking with a local bike shop (LBS) about options for ordering an Xtracycle Edgerunner. The guy we worked with did a great job helping us price the different options. Then came decision time. To make the comparison easier, I added some details to the “pricing” page of the standard bike specs document for the Edgerunner, so we could see options with prices all on one page (details here: EdgerunnerOptions). We were fairly sure we wanted an internal hub, and the most affordable option was to just start with the frame & fork and build it up from there (by which I mean the bike shop will be building it up from there, with some input from us as to the components). As for accessories, we’re getting Standard Racks, the FlightDeck, the KickBack Center Stand (a super-stable, two-legged kickstand) and the X2 bags (which are waterproof). So now we wait. The fact that we’ve had so much crappy weather and so much snow and ice on the roads actually makes the wait easier — even if we had the bike already, it would mostly be sitting around, lonely and gathering dust. UPDATE: I wrote this post on Sunday. Yesterday, our LBS guy checked in with Xtracycle, and they’re now not expecting this shipment until early- to mid-April. Boo, hiss!!! I decided not to order the child seat (Yepp Maxi EasyFit) directly from Xtracycle, in the hopes of finding a used one on EBay or Craigslist. Turns out, there aren’t many out there, at least not on EBay or my local-ish CL options (StL, Kansas City, Colombia, MO), so when I saw an auction for a “new, opened-box” blue Yepp Maxi on EBay, I decided to go for it, and I won the auction. Once you factor in the shipping, it wasn’t a great deal, but it did save some money. The seat I bought included the adapter for attaching it to a regular bicycle, which we won’t need once we have the Edgerunner. 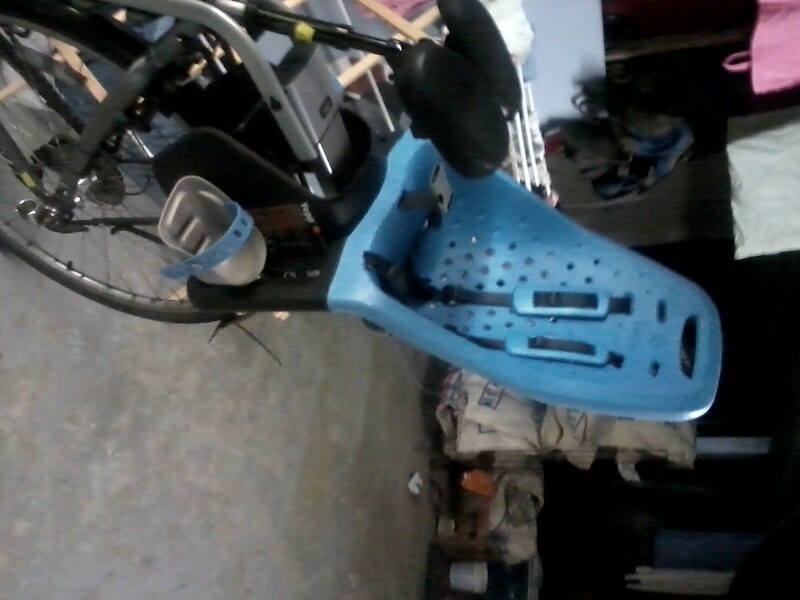 However, since we don’t expect the Edgerunner for at least a month, I installed the seat on Matthew’s bike. When I first opened the box and started looking at the seat and the mounting hardware, I had a moment of panic where I wondered if we would, in fact, actually still be able to use our rear racks and panniers with the child seat. The assumption that we would not was largely what led us to purchase a longtail in the first place. Had we just spent all that money for nothing? At just over 35-pounds, Sir is still under the 38-pound weight limit for the IBert front seat (though his height means his legs are a bit cramped), and I’ll enjoy getting at least a few more rides with him up front with me. Once we get the Edgerunner, I’ll be looking for a new [long-term loan] home for the IBert (if you’re interested, and local, let me know), hopefully someone who will use and enjoy it as much as I did! This entry was posted in Biking and tagged biking with baby, biking with kids, cargo bike, edgerunner, longtail. Bookmark the permalink. I hope you get your Edgerunner wtihout additional delays. I’d love to hear what Matthew thinks of the noseless saddle! If you have posted on this before and I’ve missed it, a link is fine. Cheers and how about the forecast today!? Yes, I actually really liked the apple green color of the Yuba Mundo (which was our second choice longtail). My current bike colors are mostly dark green plus some black (BUB) and fire-engine red (Baby Jake). Red would not be my first choice of anything, ever, but it was the only color available in that bike that year. In the end, I don’t really notice or care about the color of my current bikes in day-to-day riding, so it really shouldn’t be a huge issue with this one, either. Bad news. That Yepp Maxi Standard seat is not the model which is compatible with the Xtracycle. Super confusing and super frustrating, this happens to people all the time. Thanks for the info. I’ll see if I can sell the standard seat locally on Craigslist and buy the Easyfit. Xtracycle said there is a chance that the Maxi standard might work on the Edgerunner with the seat tube adapter, if the seat clears the FlightDeck, but we wouldn’t know that until we have the bike. We would likely be interested in your IBert – although I have to check maddox’s weight to see how long we’d be able to use it. I suspect we’d be fine though the fall, though. Looks great! Sounds good, Jess. Let me know if it will work, weight-wise. Also, I think Gabriel started getting cramped once he reached the 36″ mark, height-wise. With the delay in getting the Edgerunner, it may be sometime in April before we’re ready to part with the IBert instead of March. You would be welcome to come over and try out the seat anytime. There are certain styles of bicycles that the IBert doesn’t work with, so we can talk about that, too. Thanks for stopping by, Robert. With our winter weather finally letting up a bit (at least temporarily), we are starting to chomp at the bit, but I know there’s little you can do to speed it up at this point — slow boat from China and all of that! I was surprised when our bike shop said that if we wanted the heavy duty pannier friendly racks for the edgerunner, the platform would wind up being at least 3″ higher than with the standard racks. Is there any chance the rack offerings will be updated to allow both the functionality of the 6″ lower center of gravity for the rack and using standard panniers? Are there any other workarounds people are using that work will to use regular panniers with the standard rack?